Maximum Velocity Track and Field Academy: Gatlin Unable to Attend Due to Injury - Will Be Replaced by Wallace Spearmon, Jr.
Gatlin Unable to Attend Due to Injury - Will Be Replaced by Wallace Spearmon, Jr.
We have been informed that Justin Gatlin will be unable to attend camp next week due to continuing rehab for a hamstring injury that occurred in mid-May during the 4x100m relay in Japan. The injury forced him to pull out of the Prefontaine Classic last weekend where he was scheduled to compete in a much anticipated showdown with Christian Coleman. Justin is disappointed that he cannot attend camp this year, and will have a message for our campers next week. 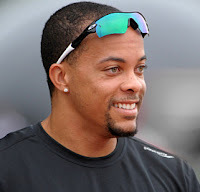 Gatlin will be replaced by Wallace Spearmon, Jr. Spearmon is a 3-time NCAA National Champion winning the 200m outdoor title in 2004 and 2005, and the indoor title in 2005. He has 4 World Championship Outdoor medals that include a silver in 2005 in the 200m, a bronze in 2007 in the 200m, a bronze in 2009 in the 200m, and a gold in 2007 in the 4x100m relay. He was also a member of the World Indoor Championship 4x400m relay that won gold in 2006. Spearmon's has personal bests of 9.96 in the 100m, and 19.65 in the 200m.